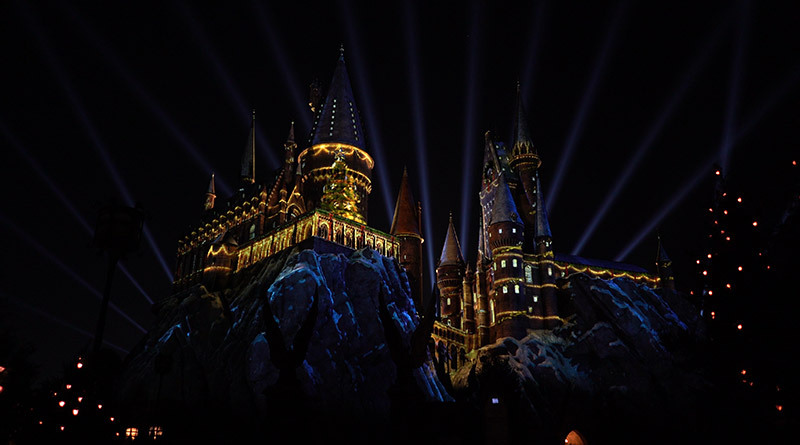 Marvel Super Hero Island at Islands of Adventure is known for its thrilling attractions like The Incredible Hulk Coaster and The Amazing Adventures of Spider-Man, but no one usually raves about the food. 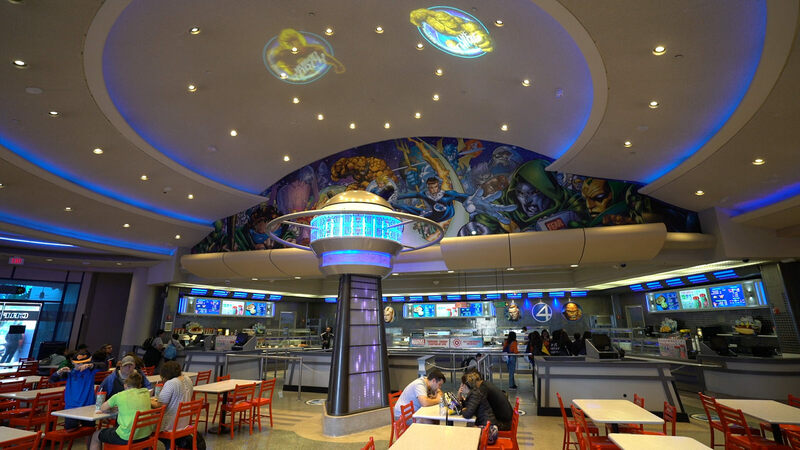 Marvel Super Hero Island is home to two quick service dining options – Cafe 4 and Captain America Diner. 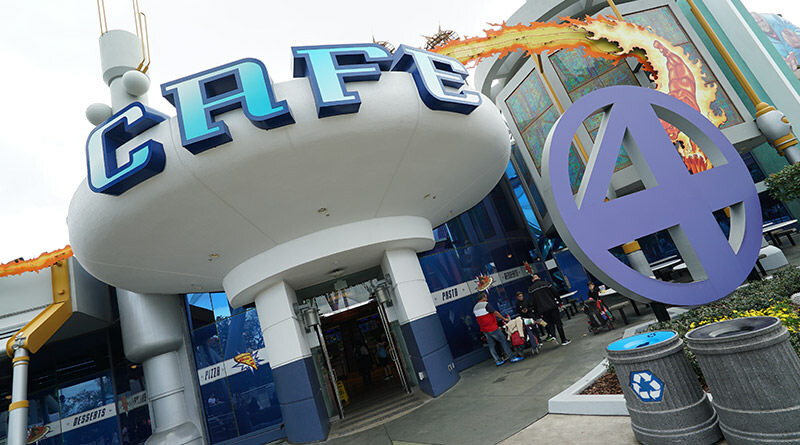 Cafe 4 is the larger of the two and themed around the Fantastic Four and it also turns into a Marvel Character Dinner that’s available Thursday – Sunday after 5:00 pm. 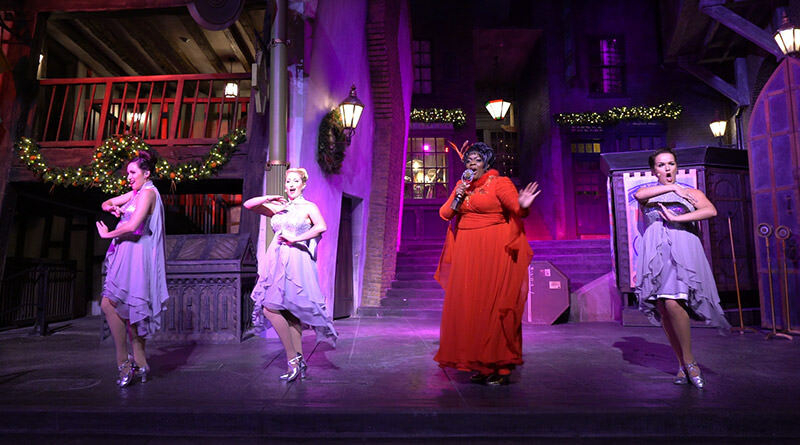 We still haven’t had the opportunity to check out the Marvel Character Dinner, but we did have time to pop into Cafe 4 to have lunch recently and you can probably guess how it went. Cafe 4 is setup inside the headquarters of the Fantastic Four and the theming comes through loud and clear, but it’s also very plain and dated like everything else in Marvel Super Hero Island besides The Incredible Hulk Coaster and The Amazing Adventures of Spider-Man. 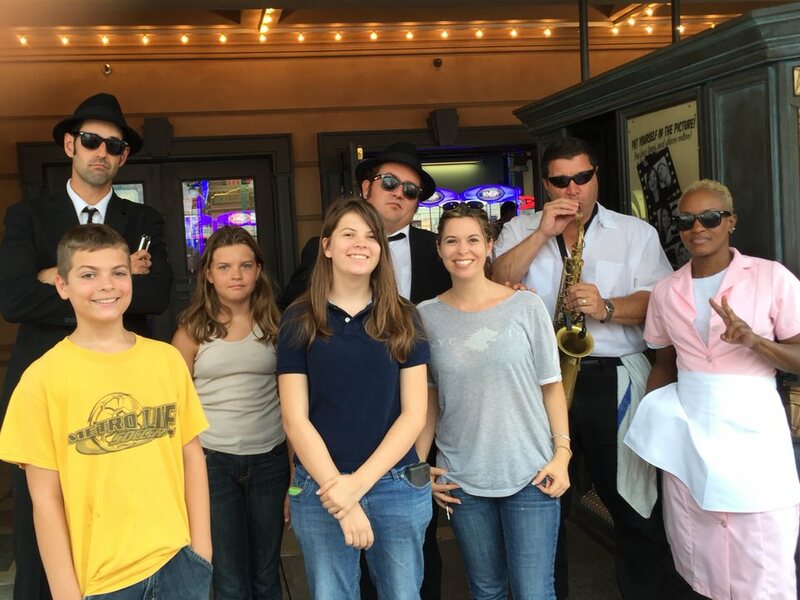 The menu consists of Italian fare from pizza to pasta, sandwiches and salads. When I say Italian fare, I am already giving them too much credit. 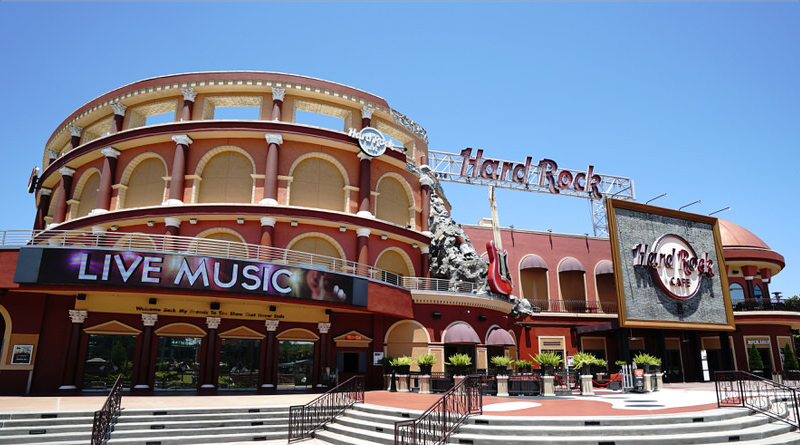 If you’re looking for actual Italian inspired cuisine then head out into CityWalk for VIVO Italian Kitchen, but if you’re looking for school cafeteria Italian then you found the place. 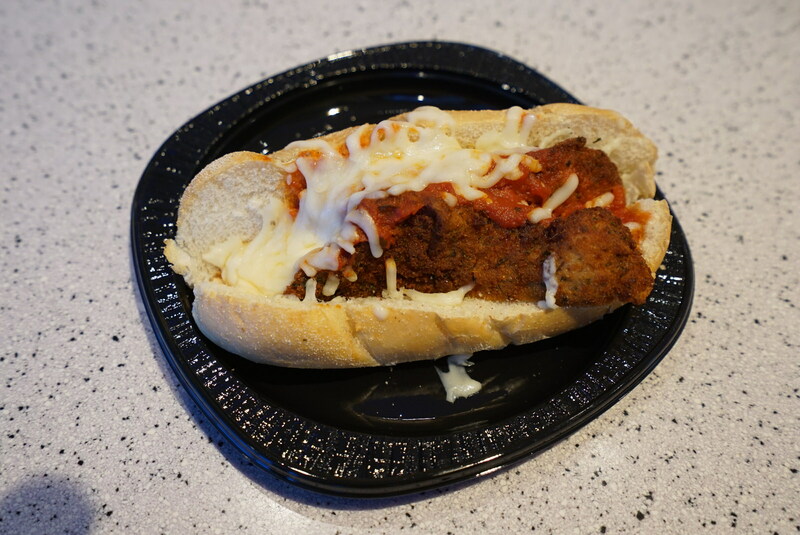 Two sandwiches are offered at Cafe 4 – a Meatball Sub and a Chicken Parmesan Sub. 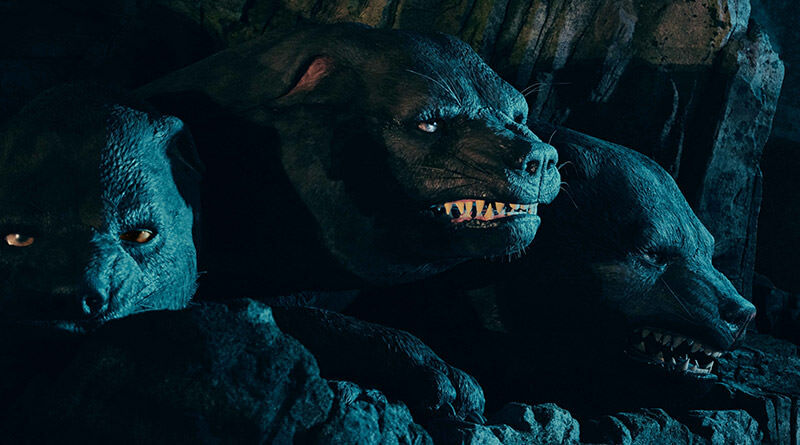 Full disclosure: when I worked at Universal Orlando, I was able to buy Meatball Subs at one of the Team Member grills for like $3, so I’ve had plenty of them in my life and I’m actually very fond of them, because they were a delicious, cheap meal when I was making very little money. I tried the Chicken Parmesan Sub at Louie’s Italian Restaurant in Universal Studios Florida a couple years back and decided it was time to give it another shot. Back then I said it was not terrible, but not great. The Chicken Parmesan Sub at Cafe 4 definitely did not meet any preconceived expectations. The sub bread felt fresh and that’s about all you can ask for from it, but the main problem was the chicken and sauce. The breaded and fried chicken wasn’t overcooked and retained a crunchy texture with moist chicken inside, but it was VERY flat chicken and could’ve easily become a disaster. The marinara sauce wasn’t jiving with the chicken for my palate, but it became a little more tolerable with the addition of extra cheese and red pepper flakes. The chicken only took up about 2/3 of the sandwich so the portion size could be a little better, or they cooks should just choose better cuts when they are building the sandwich. I wouldn’t say avoid it, but I wouldn’t recommend it. 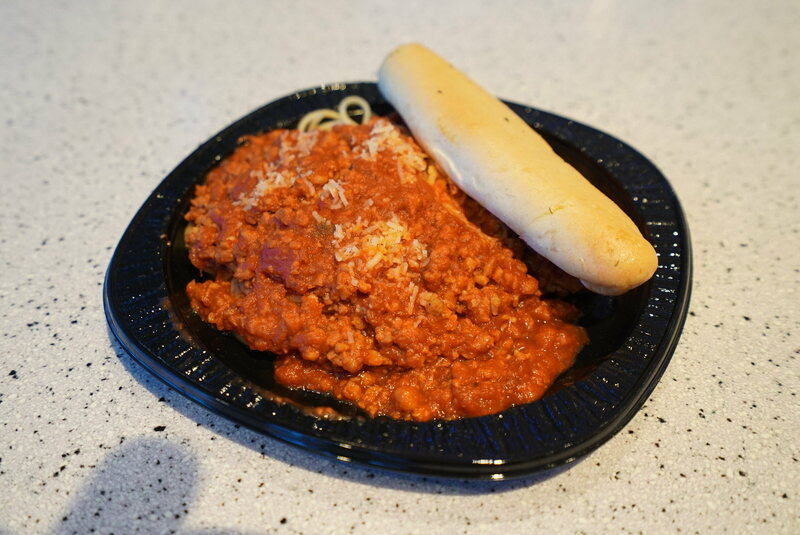 The Spaghetti Bolognese is one of the new vegan options that has been added to Universal Orlando Resort menus. It doesn’t look vegan based on its appearance, but it’s actually made with plant-baed Gardein Italian sausage crumbles. Much like the options we tried in a previous vegan dining review, if you didn’t know that the sausage was vegan then you would never be able to guess it. The sausage by itself was spicy and had the chewy texture you’d expect from sausage. The rest of the plate was pretty much a mess. The spaghetti was plentiful, but you could tell that it was boxed spaghetti that was most likely cooked and then sitting in a warmer filled with water. There wasn’t a lot of effort to lose the excess water when plating the dish, so it was watery. The marinara sauce was the same from the sub and it actually had a lot more flavor thanks to some additional oregano and the pairing with the Gardein Italian sausage crumbles. There was a sprinkling of cheese on top, which I hope was vegan cheese, so if you’re a strict vegan eater then make sure you double check… Also, the worst breadstick ever was served with this dish and all other pasta dishes. The thing was rock hard and made the Texas Toast breadsticks you find in the freezer section of a grocery store seem gourmet. Overall, not a terrible option if you choose to eat vegan, but you can find better. Should I eat at Cafe 4? Honestly, I’d say no. 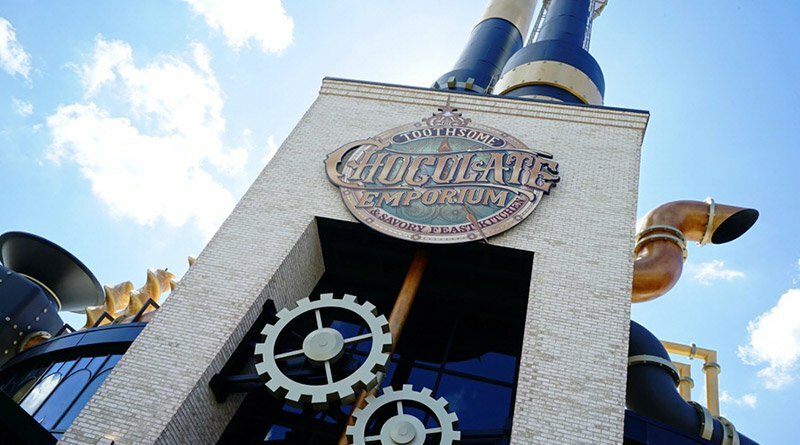 This is another one of those quick service options at Universal that has a cloned menu from multiple other locations and it’s just as mediocre as the rest. It needs a complete overhaul on the inside and with the menu. 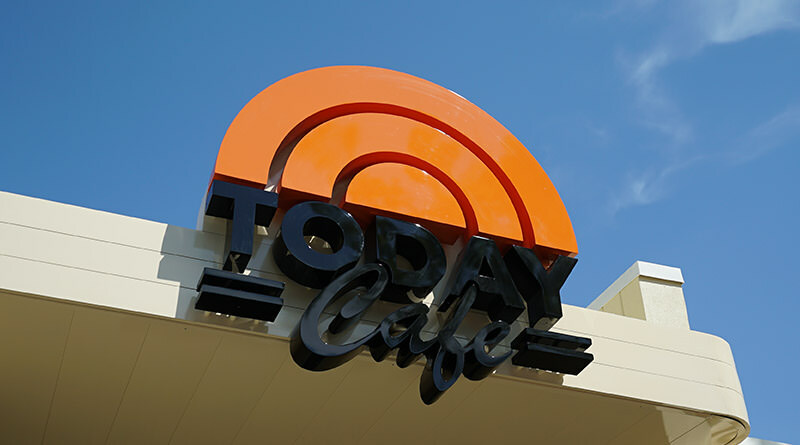 If I decide to eat at Cafe 4, what should I get? If you insist on eating at Cafe 4, because the Fantastic Four movies are your absolute favorite then I would recommend either the Meatball Sub or a slice of pizza. Both are edible and the Meatball Sub can be pretty tasty when served hot and fresh. If you enjoy watery pasta then by all means try any of the pasta dishes on the menu.